As I’ve grown in my faith over the years, I’ve learned more and more that what we get in this life (both good and bad) is so rarely directly related to how many good works we do or how many times we stumble and make mistakes along the way. Of course that’s not to say that when we make mistakes there aren’t consequences, but I think that subconsciously I’ve lived with the mentality that if I do enough good in this world, then good things would happen to me. Along the way I’ve realized that this simply isn’t true and that God doesn’t work on a system of tallies and check marks on a to-do chart. Our stories are mapped out by Him with purpose and intention, specifically designed to grow us in different ways. This past year has been difficult, filled with lots of tears and more than my fair share of fearful moments. Many times along the way I asked God, “Why not us? Why don’t we get a baby like so many other people? Why do we have to lose our little ones?” But now that we’ve been blessed with this little miracle baby, I’ve been overwhelmed with feelings I didn’t expect. More than a couple times I’ve broken down in tears asking God, “Why me? Why do we get this miracle?” I feel so incredibly undeserving of this gift God’s given us and of the prayers people have prayed on our behalf. I guess my garden is an appropriate example of how you don’t always get what you “deserve” in life. We’ve given our little garden everything it needs to grow and be fruitful, including plenty of water and weeding and the like, and yet our harvest has been completely disappointing. Just a handful of zucchini and yellow squash, no peppers, the rabbits ate our green beans and our spaghetti squash never came up. Thankfully our tomato plants have done relatively well and we’ve just started experiencing the overflow of tomatoes from our garden. I can’t tell you how many batches of this homemade tomato-basil sauce I’ve made (maybe 4 or 5 in the last handful of weeks?) 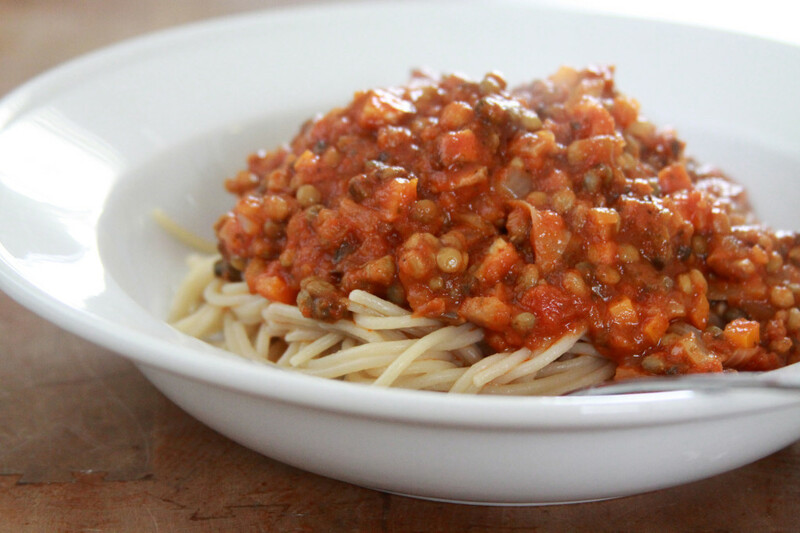 but it’s quickly become a staple in our house, transforming even the most basic pasta dish into something special. When I served this baked rigatoni pasta to Joe last week, his eyes lit up and he quickly declared this one of the best things I’ve ever made. Considering how much I’ve cooked for him over the years, that’s saying something, friends. An added bonus? It’s easy to prep this dish in advance, cover and then cook it up when you get home from work at the end of the day! Heat oven to 350F. Spray an 8x8-inch baking dish with cooking spray; set aside. In a medium skillet, heat the oil over medium high heat. Add in the tomatoes, garlic, salt, pepper, sugar and herbs. Simmer, stirring occasionally, 10 to 15 minutes or until the tomatoes are completely broken up and the sauce begins to thicken slightly. Remove from heat and stir in the cream. In a large mixing bowl, combine the pasta, tomato sauce, zucchini, feta cheese and chicken. Spoon into prepared baking dish. Top with the Italian cheese blend and grated Parmesan cheese. 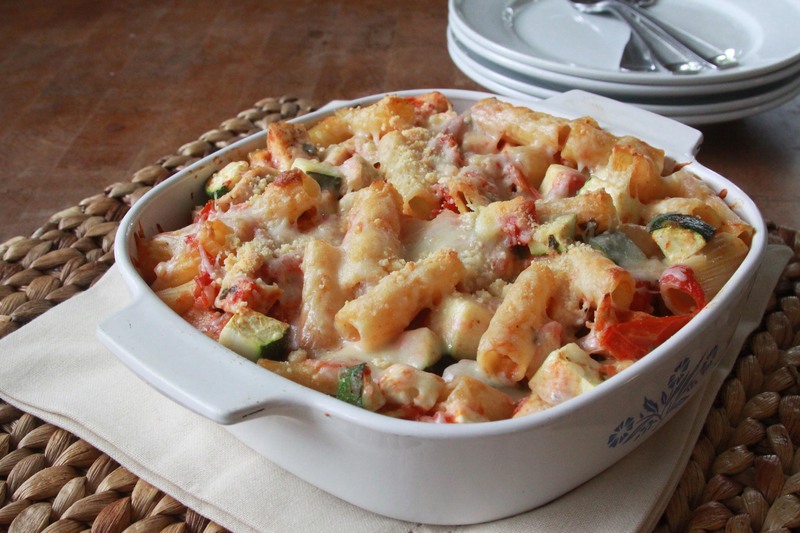 Bake 20 to 22 minutes or until cheese is melted and zucchini is tender. Spoon into bowls to serve. Before I share this recipe with you, I should clarify that while a lot of my recipes are on the healthier side, this recipe isn’t winning any awards for being health conscious. However, when I threw this meal together last week for Joe after a trip to the gym, he raved about how delicious it was and demanded that I blog about it. Usually Joe isn’t one to demand I blog about anything, so when he insisted I obliged. 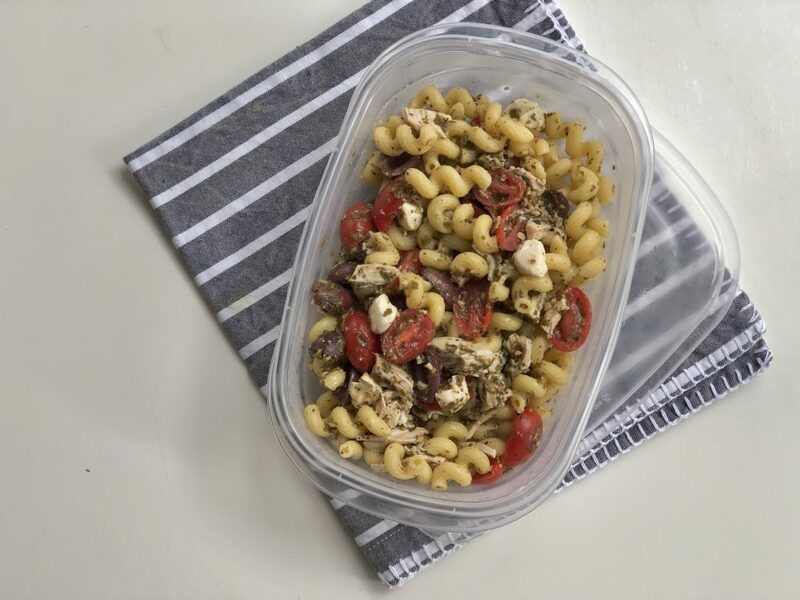 In fact, I made a batch of this pasta earlier in the week and put it into lunch containers immediately so that Joe would be able to enjoy lunches at work that were better than turkey and cheese or PB&J. If you’re a fan of meals that are quick and easy to throw together and require very few ingredients (and really, who isn’t?) then you will love this recipe. I’ve tried it both warm and cold and can say that both ways are delicious, although I do prefer it warm since the flavors are more pronounced. After making this dish a couple times, I’ve been thinking of ways to add a little freshness to this dish, mainly something green. Although I didn’t add any, a couple handfuls of arugula or a little fresh basil would be a great addition. Let me know if you try it and add anything different to your version, since I’m always looking for ways to adapt dishes and keep things fresh. 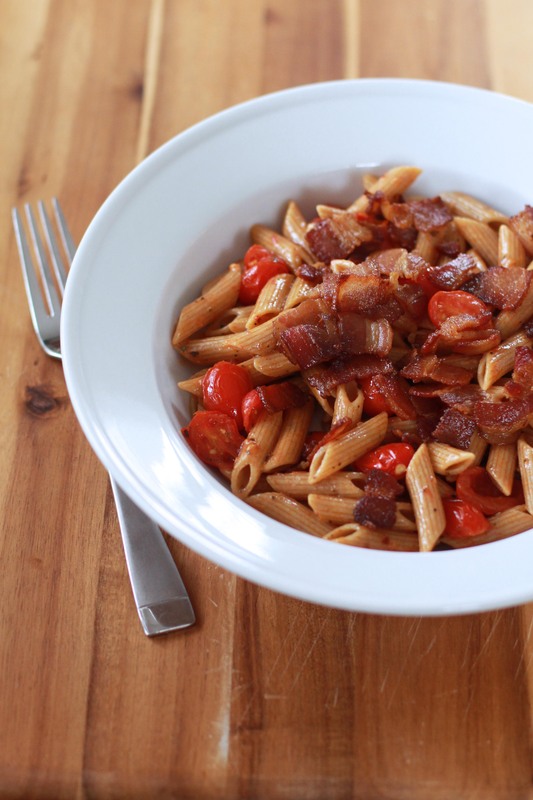 This is Joe's new favorite dinner, and I don't mind making it because it's so incredibly easy! This makes enough to serve two generously, or three smaller portions. It's usually enough for Joe to eat for dinner one night and have leftovers to take to work the next day. Meanwhile, cut bacon into small pieces. Place bacon in a large skillet over medium heat. Cook, stirring frequently, until bacon is very crispy and deeply colored. Use a slotted spoon to remove bacon from skillet and transfer bacon to a paper towel-lined plate to drain. 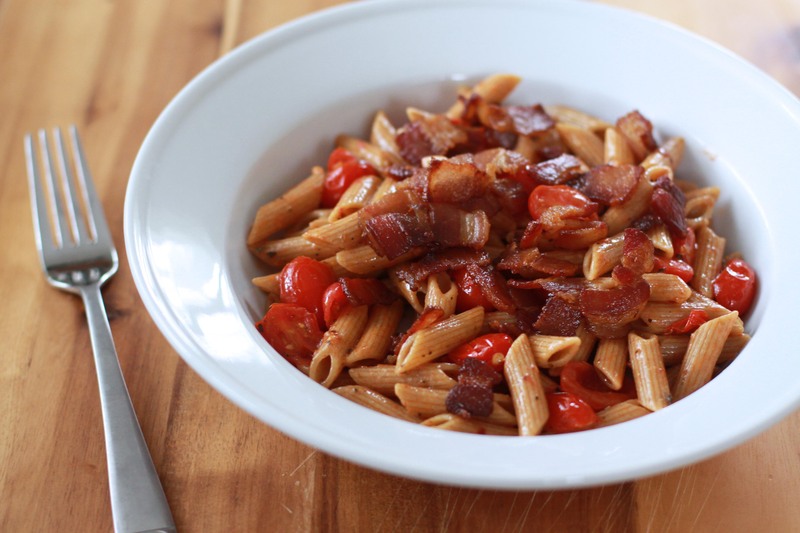 Add tomatoes to skillet with bacon drippings and cook tomatoes over medium high heat 2 to 4 minutes or until tomatoes are softened slightly. Add butter, oregano and red pepper flakes to skillet along with cooked pasta. Divide pasta mixture among two bowls. Top with the bacon. Serve immediately. Lately I’ve felt incredibly distant from Espresso and Cream. I can honestly say that in the 3 1/2 years that I have been blogging, I have never felt my passion and excitement for blogging trail off in the least bit. Until recently. That’s not to say that I’m going to stop blogging, it’s just something I’ve been thinking and feeling for the last couple weeks. More than anything, it seems that my life is so full of food that at the end of the day I feel creatively tapped out. My job, which I love, has me in the kitchen constantly, creating new recipes and developing new ideas. And to top things off, Joe and I embarked on a cleanse that has made every day eating and cooking more of a creative challenge than I had anticipated. 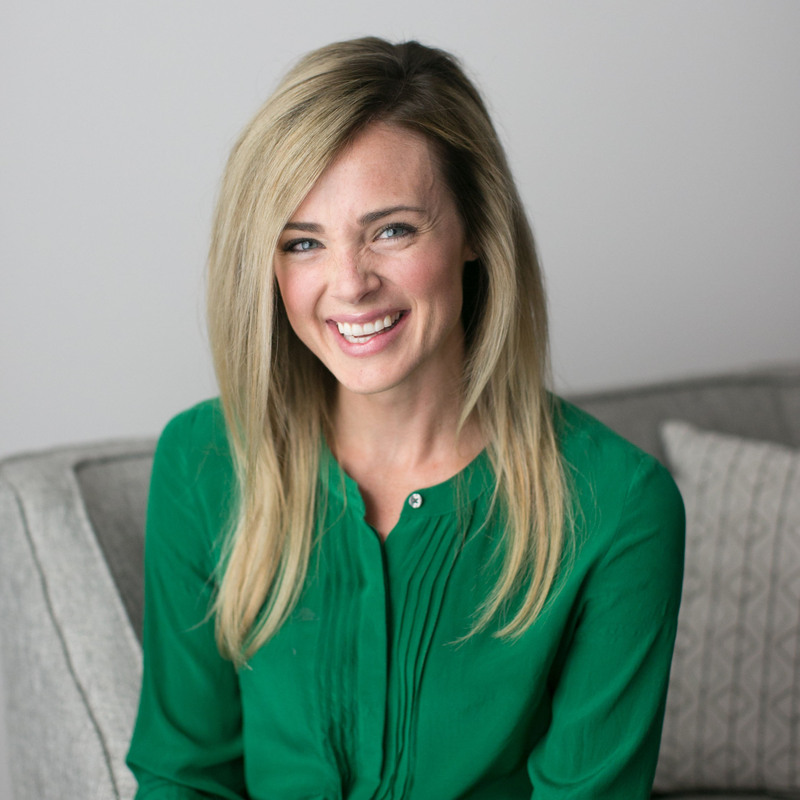 I’ve loved our cleanse and enjoyed being forced out of my comfort zone in the kitchen. Reading labels is a new (not so favorite) pastime and I have a new found appreciation for anyone who has to live with a food allergy, especially a gluten or dairy allergy since it is in everything. That said, I’ve also had a lot of my creative juices zapped since planning for and preparing three cleanse-friendly meals a day takes a lot of time, effort and energy. Already I can see how things are starting to get easier and I’m sure that if Joe and I were to stick to this diet longer term it would become second nature to me, but for now it is uncharted territory. All of that is really just me saying thank you for understanding if I’ve seemed a bit distant and removed from E&C over the past couple weeks. We are now on our last week of the cleanse and feeling great, but I’m also looking forward to adding some foods back into the regular rotation, mainly eggs since they are so useful in the kitchen. In the meantime, I thought I would share with you this dish I made for lunch on Sunday. It’s incredibly simple to pull together and also super tasty. I should also note that it is husband-approved, meaning it feels hearty and satisfying, without weighing you down after. 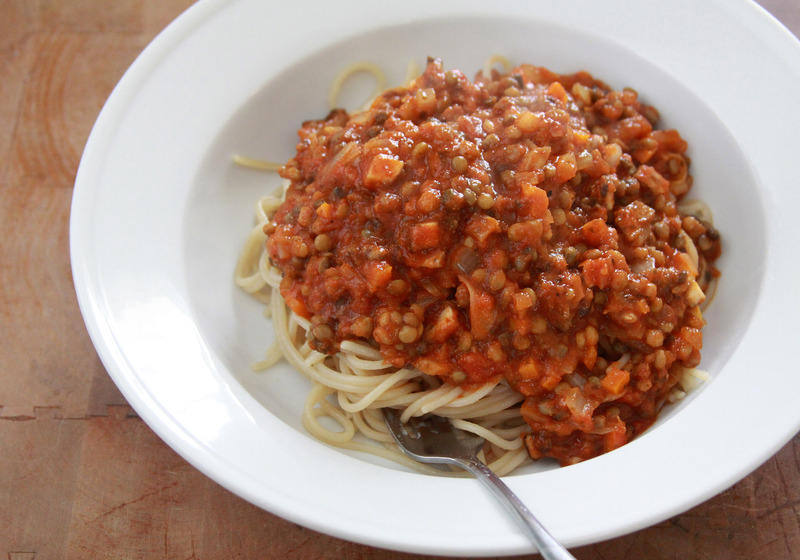 The “meat sauce” is made with a mixture of lentils, mushrooms, onions and sweet peppers. The combination is flavorful and packed with protein and vitamins. And if, like me, you are seeking ultimate convenience, there is no shame in purchasing pre-cooked lentils to cut down on time in the kitchen. *Cook pasta in salted water according to package directions. 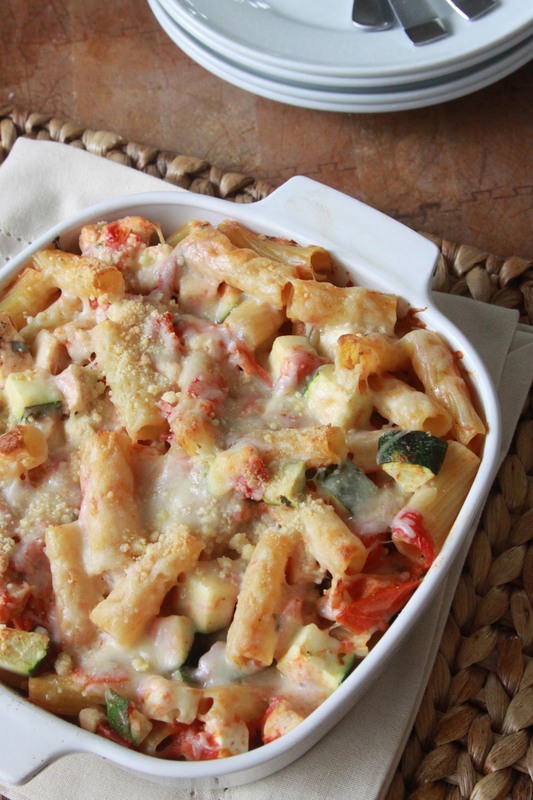 While pasta cooks, you can throw together the rest of this dish. *Heat oil in a large skillet over medium high heat. Add in the onion and cook for 3 to 4 minutes or until onion is softened and opaque. Add in the garlic, sweet pepper and mushrooms and continue to cook for 3 to 4 minutes more or until pepper and mushrooms are cooked through and tender. Add in the lentils, salt and black pepper. Stir until well combined. *Pour sauce into skillet and reduce heat to low. Cook for 2 to 3 minutes more or until sauce is warmed through and flavors are mixed together. *Serve mixture atop cooked pasta. The road warriors are back from Chicago! We traveled across the state of Iowa and over to Illinois for the weekend to stay with my sister-in-law (Joey’s sister) Amber and her hubby Jake. They are expecting a baby in a little over four weeks so this will most likely be the last time we see them until the baby arrives. So darn exciting! 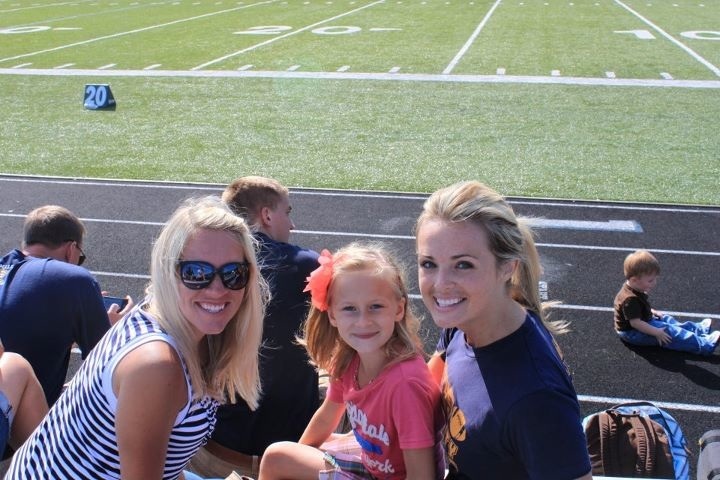 The other purpose of our trip was to watch Jason, Joey’s brother, play football. 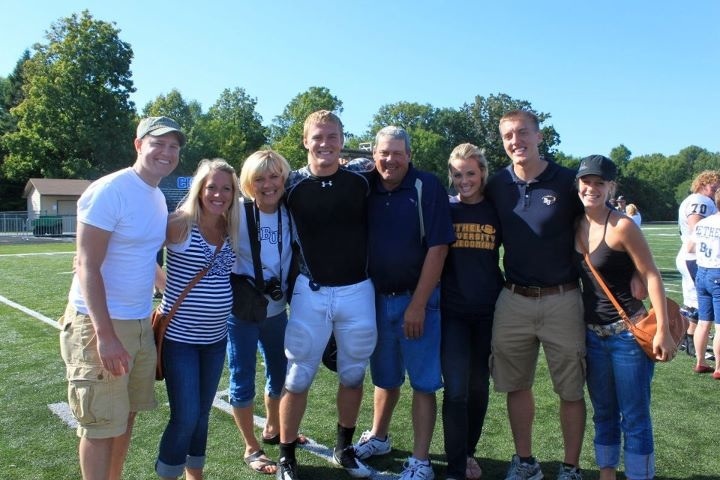 He’s a senior in college so we are going to try and make it to as many games as possible this season. Before we headed out for the weekend, I found myself with a bag of quinoa pasta on my hands (more on that later). 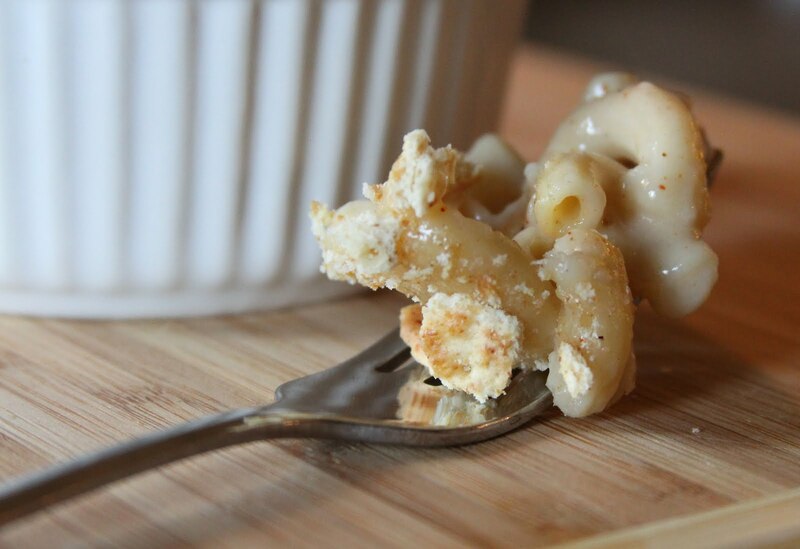 Paired with a block of cheese, it seemed like the perfect excuse to make a slightly healthier version of macaroni and cheese. I’m a sucker for a good homemade version of the cheesy stuff and figured Cooking Light would be the best place to start looking for a recipe. Of course, they did not disappoint. The original recipe wasn’t gluten-free, but making a few small alterations quickly turned things around. I also added in some creamy Dijon mustard and paprika for a bit of tang and dimension and sharp white cheddar cheese for another punch of flavor. After making the stovetop recipe, I spooned the mixture into four ramekins and covered the ramekins with aluminum foil. 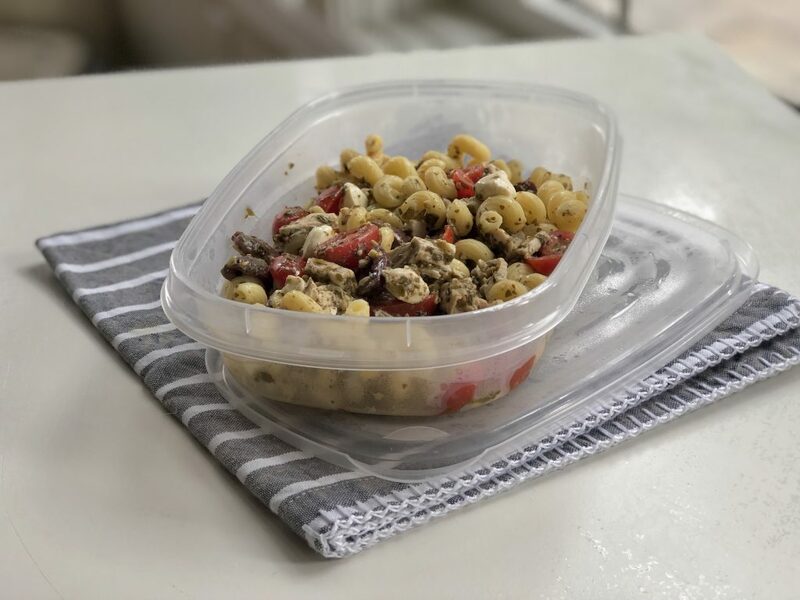 When we returned from our trip, dinner was ready to be heated up in the microwave and finished in the oven, just be sure not to top with cracker crumbs and broil until you are ready to eat. Personally, I find the best way to eat this dish is when paired with a large side of steamed broccoli to balance out all the cheese. What’s your favorite mac and cheese add-in? Updated 9.13 to Note: Reader Jennifer sent me a very kind and insightful e-mail after I originally posted this recipe (which called for gluten-free whole wheat crackers) letting me know that such a thing doesn’t exists since it is made with wheat, which contains gluten. She is completely right and I’ve made changes to the recipe to reflect this. *Cook pasta according to package instructions. Drain and set aside. *Combine milk and flour in a medium saucepan, stirring with a whisk. Cook over medium heat for 2 minutes or until mixture is thickened, stirring constantly. Add in the mustard, paprika, shredded cheddar cheese, salt and black pepper. Stir until the cheese is melted and mixture is smooth. Remove from heat. 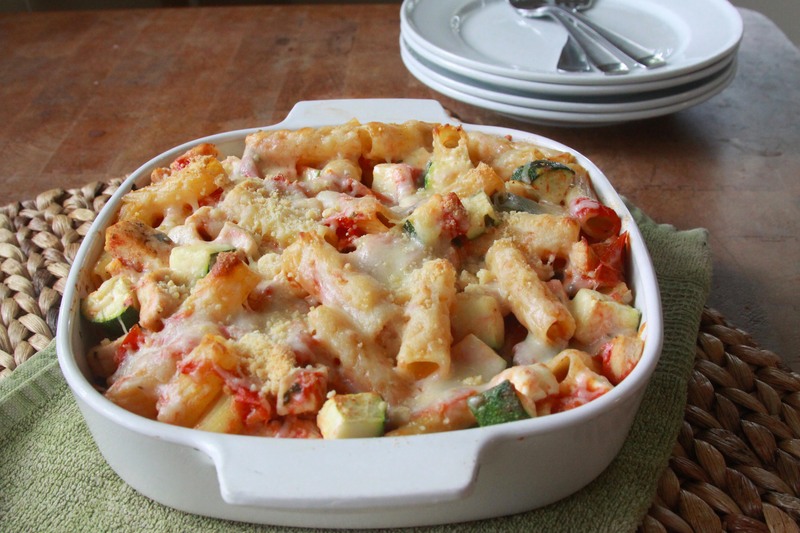 *Add pasta to the cheese mixture and stir gently until evenly coated. Spoon pasta mixture into four ramekins. Top with crushed crackers, if desired. *Preheat broiler. Broil mac and cheese for 1 minute. Remove from heat and serve immediately.